Retail sales increase and private business sector expansion were better than expected in euro-zone. Will the EU50 advance continue? Latest euro-zone economic data were positive: retail sales in January rose more than expected, and private sector expansion accelerated more than forecast. The pace of private sector activities expansion in February was boosted due to the services sector expansion while manufacturing shrank for the first time since June of 2013. At the same time consumer inflation edged up: headline inflation ticked up to 1.5% in February from 1.4%. Meantime producer prices index maintained 3% increase rate in January. Positive Euro-zone data are bullish for EU50. 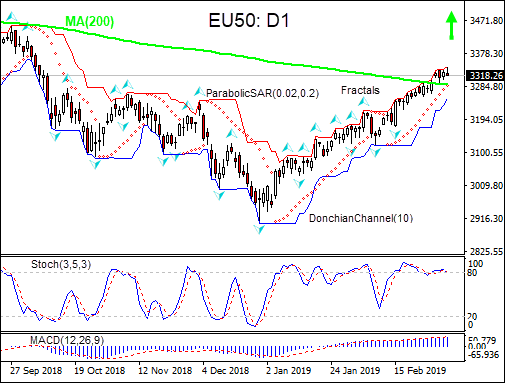 On the daily timeframe EU50: D1 is retracing higher after hitting 28-month low in the end of December 2018, and has risen above the 200-day moving average MA(200). This is bullish. The Donchian channel indicates uptrend: it is tilted up. The Stochastic oscillator is in the overbought zone but is about to fall back. We believe the bullish momentum will continue after the price breaches above the upper Donchian boundary at 3341.01. This level can be used as an entry point for placing a pending order to buy. The stop loss can be placed below the lower Donchian channel at 3251.18. After placing the pending order the stop loss is to be moved every day to the next fractal low, following Parabolic signals. Thus, we are changing the expected profit/loss ratio to the breakeven point. If the price meets the stop-loss level (3251.18) without reaching the order (3341.01) we recommend cancelling the order: the market sustains internal changes which were not taken into account.